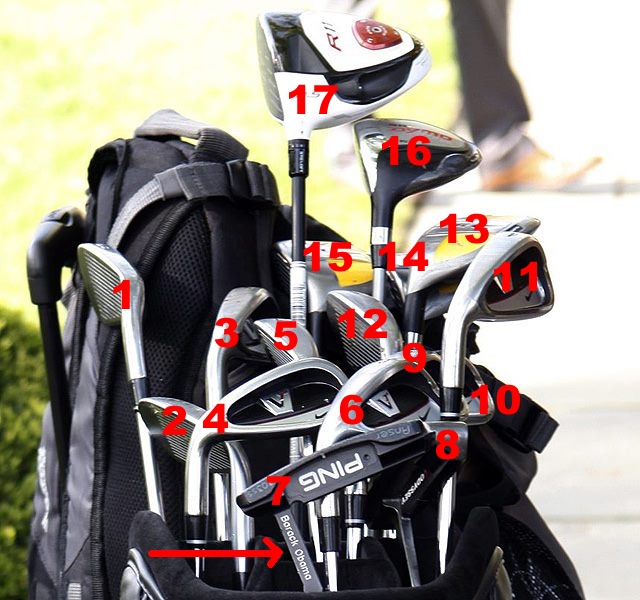 What’s in the bag is one of my favorite monthly features in Golf Digest. I think what a player carries in his/her and their set makeup says a lot about the type of player they are. For example, when you see a weekend warrior carrying and playing a 3-iron your first impression would be to that he/she might be a decent player. However, when that same player carries, a 3, 4, and 5 iron and 3, 4, and 5 hybrid and 2 different yet similar putters your opinion of that player might not be very high. Well what if that golfer was and is the current president of the United States Barack Obama who you may or may not have voted for? Well, I suppose I will can keep my opinions and politics to myself as this is a golf blog not a politics and opinion blog.